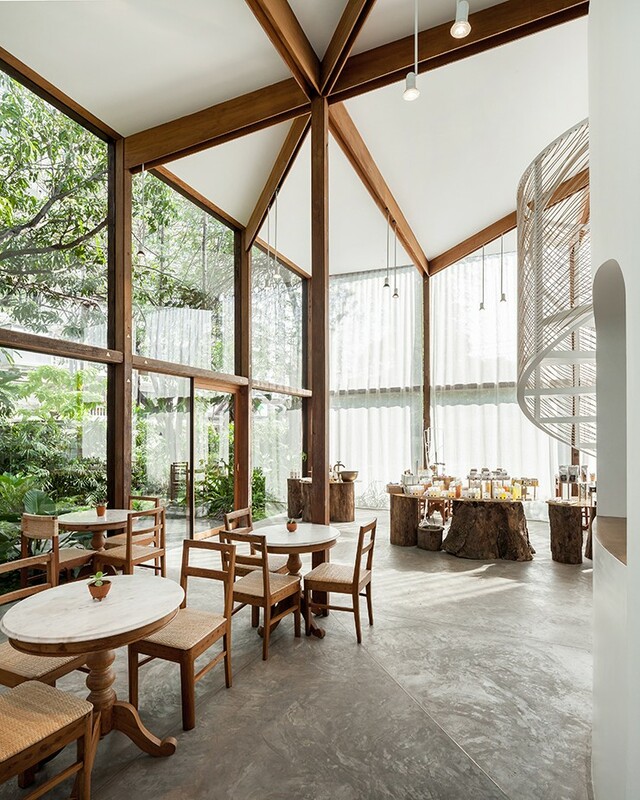 Located in Bangkok, Thailand, the Patom Organic Living Cafe is everything I’ve ever wanted in a coffeeshop. The cafe serves as a shop for Patom Organic Living products, a classroom for sustainable living workshops and a farmer’s market for local farmers to sell their goods. Designed by the architects at NITAPROW, the shop is encased in glass and set against a wooden frame. It’s perfectly placed in the center of a lush garden full of fruit trees and vegetation. The structural posts and beams were made from reclaimed Redwood and Tabak wood that was recovered from the owner’s abandoned houseboat. I love that the wood has such personal history to it. View more photos from Patom Organic Living Cafe below. Photography by Ketsiree Wongwan.